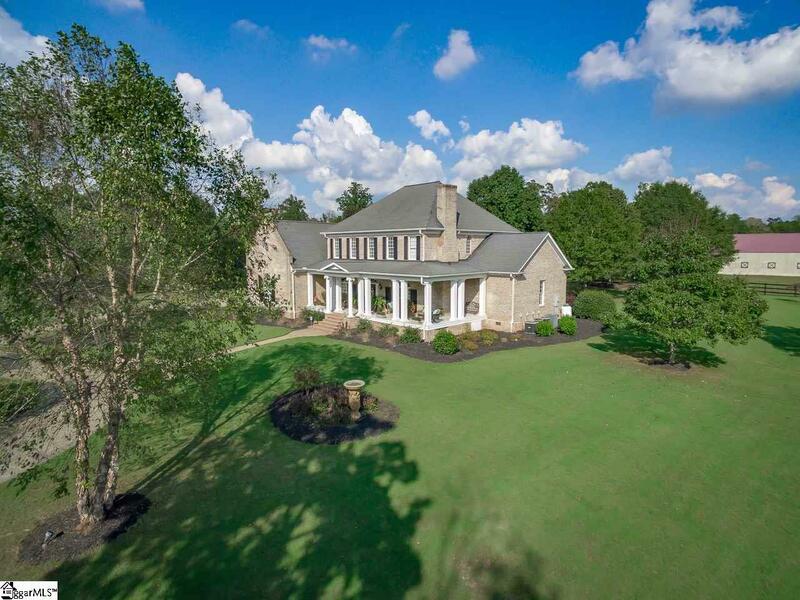 Builders personal, Private estate on 50 Rolling Acres convenient to I-26 and I-85, just 25 minutes from BMW and the National Equestrian Center. 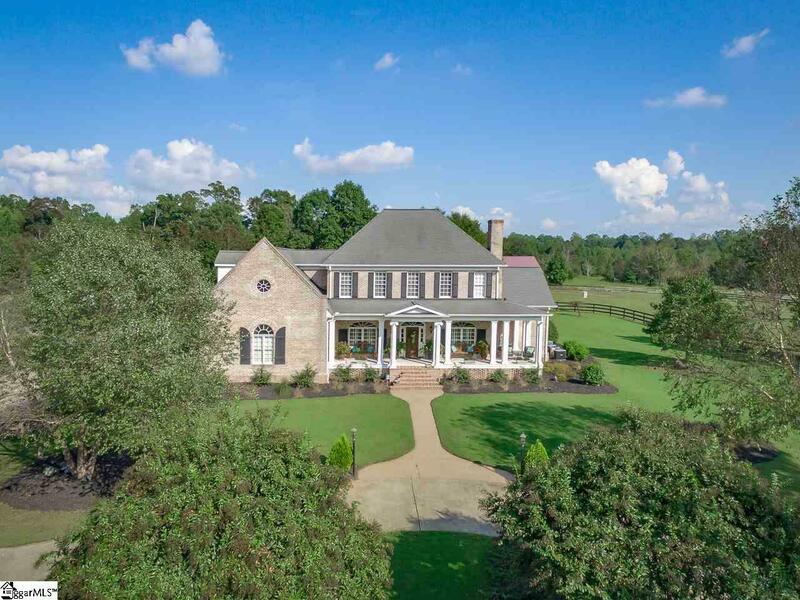 Enter through the wrought iron gate at the top of the hill and wander up the winding paved driveway lined with beautiful oak trees and Fenced Pastures. 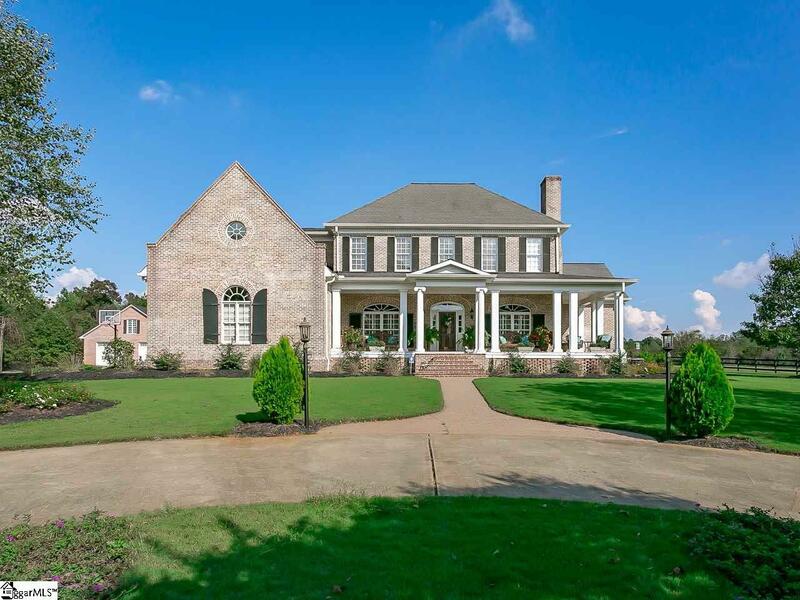 The superior Craftsmanship and finishes in this all Brick, ONE-OWNER home are evident throughout every detail- from the massive ornate molding, plentiful transoms, faux finishes, custom tile designs, and overall thoughtfulness to the layout. 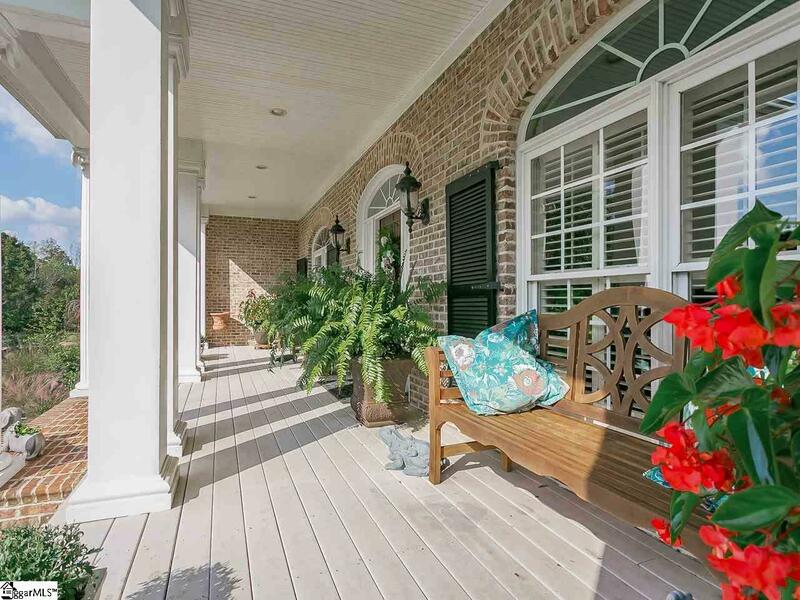 Walk in through the grand columns from the Rocking chair front porch and into the heart of the home at the Foyer with custom tile work, faux ceilings and the arched entryways leading into the Sitting room, a formal dining and living room. The living room area features Cathedral ceilings, Sprawling Windows, and a grand Gas log fireplace with custom Ornate Molding finishes niched between built-in Book cases. With this Open concept floor plan, an additional archway opens the living area into the Eat-in kitchen with plaster faux finish painting, TWO center islands, a WALK-IN PANTRY, Ice-maker, Granite countertops, and elegant cabinetry including that of the built-in refrigerator. Off of the breakfast area, sits the over-sized Master suite featuring triple trey ceilings with cove lighting, and a master bath fit for a spa-like experience with its separate soaking tub enhanced with custom columns, double vanity with granite countertops, baroque chandelier, and great tile shower with a bench. The master suite would not be complete without HIS & HERS closets, and naturally, hers is sprawling with a center island complete with cabinet space for storage and a built-in ironing board. Also on the main level, sits the office with its old world charm in custom floor-to-ceiling book casing and woodwork, which could easily be transformed into an additional bedroom since there is a full bath and closet adjacent. The second level of the home can be accessed by two separate stairways, including one nestled off of the back of the kitchen. Upstairs is where the additional three bedrooms are located. Each of these bedrooms features their own large bathrooms, and all of the rooms are equipped with ample closet space and superb views of the sprawling estate and pastures. For entertaining, one wing of the upstairs features two over-sized bonus room areas equipped with a disappearing projector screen for a movie theatre room, and ample storage space in built-in cabinet space along the walls. The second level also features most of the storage space in the house, including pull-down stairs to usable attic space, and a disappearing bookcase that leads to additional walk in floored attic storage- the perfect secret space to hide your mess or to be organized! Supplementary storage space can be found in the 40x60 detached garage/workshop complete with 3 large roll-up doors, a half bath, and a full unfinished and fully insulated bonus room area above. The 30x80 barn located conveniently close to the home features 4 PROFESSIONAL GRADE HORSE STALLS, a Tack room, and Covered shed off of the back for hay and feed storage. Over half of the 50 acres on which the home is located are fenced in with black board fence. There are 3 SEPARATE PASTURES and one 4-acre paddock. The property itself is a rare gem- a private oasis of woodlands, rolling pastures, 2 winding creeks, and a plethora of beautiful views. This place is special. Come and see for yourself. Recent appraisal on file for above current list price.